A 'systematic assessment' carried out in 2014 by DECC (The UK Department of Energy and Climate Change) found at least 5,000 community energy groups active in the UK. We regularly heard the DECC minister (now sadly out of government) Ed Davey speak of how instead of the big six energy companies in the UK he wanted to see the small 50,000. 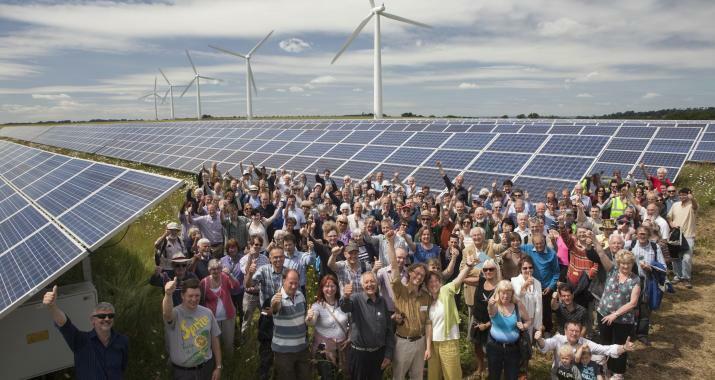 Community owned energy is already big business and getting bigger. We now have several community energy investment web sites where investors can get very attractive rates of return by investing in something they believe in. These sites include Ethex, Trillion Fund and Abundance. This adds up to a quiet revolution in energy enabled by good government policy, web based peer-to-peer investing, and people who wish to get a return on their money but are shying away from investing in more traditional places like the stock market. This shift is being driven by investor appetite, a failure in traditional investing strategies to generate the sort of returns desired and well-documented market rigging and also due to the growth of so called impact investing. Impact investing is using money to achieve a return in something you also believe in and wish to support. It is also being driven by government support, mostly through the Feed In Tariff (FIT), but also through sensible planning regulations (except notably for land based wind projects) and other measures. There is also the wish by many communities to own their energy resources, which unlike fossil fuel are local, generate jobs and investment, and are location specific. Chris Rowland, a founder and director of OVESCO said, “Ed Davey’s aspiration of lots of distributed local energy companies is achievable with the right government policies.” He went onto say that “The future of local energy development will probably come from the right partnerships - with local government, technology partners, and local people.” Chris Rowland will be presenting a day-long workshop at the 2015 Transition Network International Conference on the 18th of September, 2015, at Seale-Hayne near Newton Abbot, Devon. If you want to find out how to get in on the big opportunity that community-based energy is presenting then this workshop is designed to do just that. This event is one of a number of in-depth how-to, day-length workshops designed to provide learning from some of the pioneers in community-based businesses. This 3-day gathering of people at the cutting edge of community development and peer-to-peer social enterprise will be a unique chance to learn and contribute to one of the most exciting social experiments of the 21st century. To book your place head to the Transition Network website. Naresh Giangrande is the Co- founder of Transition Town Totnes, the first Transition Town and Transition Training, Naresh has been involved in designing, running and evolving many of the events, groups, and trainings that have been at the heart of the enormously successful Transition Towns project. He has delivered the Training for Transition, Transition Talk Training, Train the Trainers, and Transition training for Local Authorities and organisations to hundreds of participants in 11 countries. As one of the Transition Town founders he has given dozens of lectures and interviews, and spoken at many conferences and other public events. He set up and coordinated the energy group of TTT, and is currently a director of TTT ltd. Prior to Transition Towns he has lived and worked in an eco community, was Managing Director of a small to medium sized enterprise, and a gaffer in the film industry. He has also taught meditation, has a chemistry degree from the University of Pennsylvania, was an Eagle Scout, and is father to two lovely daughters.